(Newser) – The Incredible Hulk was feeling pumped up this week—but with IV fluid, not testosterone-induced rage. 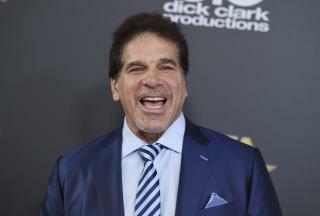 On Wednesday night, Lou Ferrigno posted on social media a picture of himself wearing a green hospital gown (naturally) and hooked up to an IV in a medical center in Santa Monica, Calif., noting he "went in for a pneumonia shot and landed up here with fluid in my bicep." The 67-year-old actor implied someone administered the shot (apparently a vaccine, USA Today notes) the wrong way, warning others to "keep an eye on who's giving the shot and make sure they not only swab the spot correctly but that you watch the needle come out of the package." Good thing it didn't make 'im 'Angry'! Best advice: DO not get the pneumonia shot! Period. Even if they give it without injuring you, it is C@@@!!! anyway. When you see the advertisements for the pneumonia shot on TV knowthat it is BS.